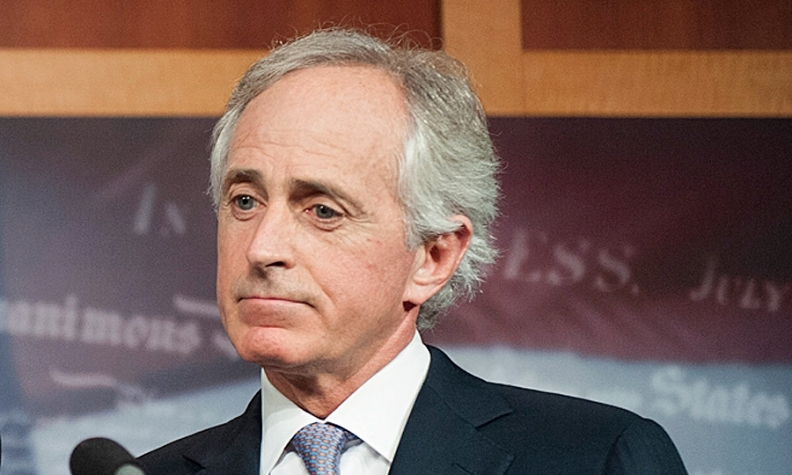 Corker: "It's real. If it weren't for that, candidly, I wouldn't be weighing in on this issue." WASHINGTON -- U.S. Sen. Bob Corker of Tennessee today urged workers at the Volkswagen AG plant in Chattanooga to vote down UAW representation this week, saying the union drive is already hurting efforts to recruit other companies. "We know the impact these discussions are already having on our ability to attract companies -- not just to Chattanooga, but to Tennessee," Corker, a Republican, told reporters during a press conference in Chattanooga. "It's real. If it weren't for that, candidly, I wouldn't be weighing in on this issue." Corker had kept quiet in the lead-up to the election, telling news outlets he would not comment out of respect to VW employees. But when the UAW urged other lawmakers to follow Corker’s example, Corker scheduled a news conference to make his opinions known, saying the UAW was misusing his words in an effort to silence the UAW’s critics. About 1,500 workers are eligible to vote in the election, which will take place Wednesday through Friday under the supervision of the National Labor Relations Board. If the workers vote to unionize, VW and the UAW have agreed to set up a German-style labor council to give workers a say in the plant's management. It has become one of the most closely watched union drives in a generation, testing UAW President Bob King's goal of winning over the foreign-owned, nonunion assembly plants of the South. The vote also comes at a crucial time for VW, which is soliciting subsidies to build a mid-sized SUV in Chattanooga or in Mexico. Corker, a former mayor of Chattanooga, played an integral role in enticing VW to build the plant, which opened in 2011 to build the Passat sedan. Under his watch, Chattanooga built the Enterprise South business park that houses the plant and persuaded the governor to fund construction of an off-ramp. Corker said the proudest moment of his career came in 2008, when, as a U.S. senator, he got the call saying that VW's management board had decided to build the plant in Tennessee. All this could be endangered by a union presence, Corker said. He predicted that the UAW would be on "good behavior" for three to five years if it prevails in the election, but he still believes the union is mainly concerned with growing its membership rolls and will revert to old, confrontational habits. "I know over time the high likelihood is, based on past behavior, that they're going to do things that are damaging to this community," Corker said. The comments underscore how much is at stake during this week's election, which will be the first secret-ballot vote at a U.S. assembly plant since 2001, when the voters at the Nissan plant in Smyrna, Tenn. turned away the UAW. The UAW smells victory. Last year, it announced that it had collected signed cards of support from a majority of workers at the plant. VW insisted upon a secret-ballot election, however, and now Tennessee lawmakers are waging a last-minute campaign to change the workers' minds. On Monday, two Republican members of the state Legislature said VW would have a difficult time getting more state incentive money if the workers vote to unionize. The plant was offered a state and local incentive package in 2008 worth about $580 million. It was taken as a threat to block further incentives, which would lessen the chances of expansion at the Chattanooga plant. Gary Casteel, the director of the UAW's Tennessee-based Region 8, criticized the politicians today, saying in a statement that they were interfering with workers' right to organize. "It's sad that ... some Tennessee politicians are threatening the economic well-being of communities and businesses, just because workers want to have a voice in the future of Volkswagen in Chattanooga," Casteel said. Corker and other state officials, including Tennessee Gov. Bill Haslam, remain in talks with VW about the potential expansion of the Chattanooga plant. Corker said they speak openly about the cost differential between Chattanooga and Mexico. Aside from its lower labor costs, Mexico has an inherent advantage because a free-trade agreement with Europe would let VW import engines and other parts from Germany without tariffs. And yet, Corker said: "I know for a fact that Chattanooga is their first choice."